RONAN – A Ronan School District bus full of children was involved in a fatal crash on Monday morning about 8 a.m. as the bus was returning to school from a morning route to collect students. 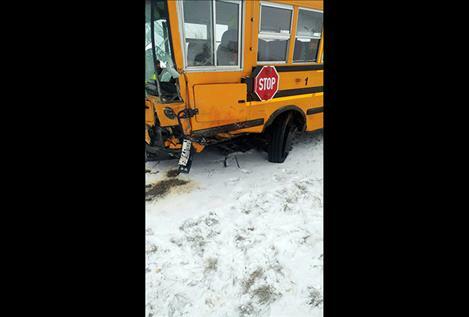 “The kids had minor injuries,” Lake County Sheriff Don Bell said of the students on the bus. The Montana Highway Patrol is investigating the cause of the crash, but Sheriff Bell was able to say that the bus was headed southbound on U.S. Highway 93, near Spring Creek Road and Lake’s Corner when it crashed with a Honda Pilot, which was going north. The driver of the sports utility vehicle died on the scene. “The passenger was up talking,” Sheriff Bell said. After the two vehicles hit, the bus driver, Pat Tougas, worked to keep the bus from rolling. “He did a tremendously good job in preventing the bus from rolling over,” said Matt Gaut, Ronan School District Transportation Director. The driver of the bus was taken to the hospital as a precautionary measure.“He was released after a couple hours,” Gaut said. Another bus was sent to pick up about 20 children still at the scene.“The troopers had the highway shut down, so the bus took the detour down Old Highway 93 to pick them up,” he said. 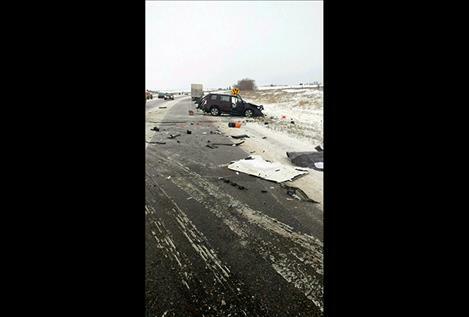 Sheriff Bell said, at this time, he wasn’t able to attribute the crash to the snowy road conditions. The cause of the crash is still under investigation.